These small square boxes are sold in bulk packs of 18. They have an easy 1 piece design and an attached red satin ribbon that is around 14 inches long. The design on the bottom of the box features a beautiful rich red with a dramatic metallic gold scroll. The metallic gold lid completes this look! 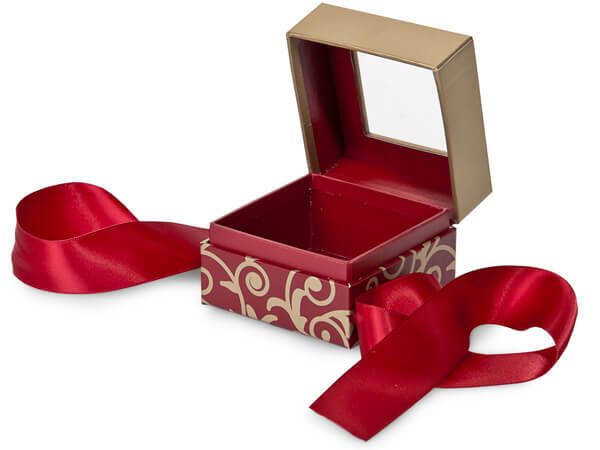 This size is perfect for your gourmet foods or small gifts on Christmas or Valentine's Day. Inside dimensions are: 2-1/2" L x 2-1/2" W x 1-7/8" H.